After the tragically early death of Lou Gottlieb in 1996, The Limeliters added Bill Zorn to the group. He played with The Limeliters until the end of 2003. Bill is an accomplished musician on the banjo and guitar. He is currently performing with the reconstituted The Kingston Trio. He has a tremendous voice range - bass to second tenor. Bill was born in May, 1948. In 1970, after studying music and drama at Arizona State University, Bill earned a place with The New Christy Minstrels where he performed, directed and toured from Viet Nam to the White House (twice) for four years. A contact of Bill's from hosting a TV talk show was a then unknown singer, Kenny Rogers. Rogers told Bill there was an opening upcoming in the New Christy Minstrels. Bill informs us, "I replaced a guy named Byron Walls, who wrote one of Glen Yarbrough's signature songs, "Grandma's Letter." This was maybe the fourth generation of the group by that time, and I stayed with them for four years as their musical director. My brother was also in the group, and it was a great experience for us." Then he became a banjo-playing full member of The Kingston Trio for three years. Bill says, "It was three years of full throttled, non-stop fun - like a Mardi Gras that never ends. But it was also lots and lots of travel and after a time I had to admit to myself that I just couldn't keep up with the pace. Remember, I had just come off of four years of the same with the Christy's. Every fiber of me was exhausted. I finally had to say to myself it's stay in the group and die, so I decided to take up my brother on his offer come have a good rest at this place in England." Bill's move to England in 1977 didn't stop him from performing, and while there he recorded a hit single with his brother called "Car '67." He has also had his share of television acting, voice-over work, and comedy, gained by teaming up with British comedian Jon Benns to form the successful duo "Bill and Benns" in England. In 1995, while still in England, Bill produced a Glenn Yarbrough album called Chantyman. Bill also performs with another band, The Arizona Smoke Revue, that plays off and on. Bill says, "It's made up of a number of solo artists who get together for some of the big summertime festivals and sing together. We all play in other bands, so we bring a very diverse mix of music to the table." The Arizona Smoke Revue can be heard on a double CD album, A Thundering on the Horizon, recorded in the early 1980s by the group. It's a staggering mixture of folk, bluegrass, rock, jazz, and just about everything else in between. It's available for $15 mail-order from Bill Zorn, 3206 W. Montebello Ave., Phoenix, AZ 85017. Bill Zorn brought two crucial elements to The Limeliters: he possesses that obligatory Limeliter sense of comedy, and his voice unmistakably contributes to retaining that magical trademark Limeliters sound! 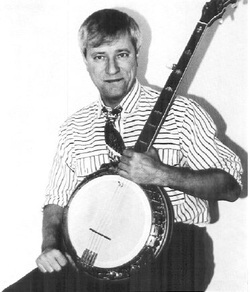 In early 2004, together with Rick Dougherty, Bill left The Limeliters and briefly joined a new group with Glenn Yarbrough called "The Folk Reunion," and substituted for Bob Shane in the Kingston Trio. By 2006, he was a regular with The Kingston Trio, along with fellow former Limelter Rick Dougherty, and long-time KingstonTrio member George Grove. He performed with that group for about 12 years, until October 2017 when the Kingston Trio initiated a new configuration of Josh Reynolds (son of original KT member NIck Reynolds), Mike Marvin, and Tim Gorelangton.